The United States is led by two corrupt establishments, one Democratic and one Republican, both deeply dependent on special-interest money, both sharing a similar perspective on world affairs, and both disdainful toward the American people who are treated as objects to be manipulated, not citizens to be respected. There are, of course, differences. The Democrats are more liberal on social policy and favor a somewhat larger role of government in addressing the nation’s domestic problems. The Republicans embrace Ronald Reagan’s motto, “government is the problem,” except when they want the government to intervene on “moral” issues such as gay marriage and abortion. But these two corrupt establishments are intertwined when it comes to important issues of trade, economics and foreign policy. Both are true believers in neo-liberal “free trade”; both coddle Wall Street (albeit seeking slightly different levels of regulation); and both favor interventionist foreign policies (only varying modestly in how the wars are sold to the public). Because the two establishments have a chokehold on the mainstream media, they escape any meaningful accountability when they are wrong. Thus, their corruption is not just defined by the billions of special-interest dollars that they take in but in their deviations from the real world. The two establishments have created a fantasyland that all the Important People treat as real. Which is why it has been somewhat amusing to watch establishment pundits pontificate about what must be done in their make-believe world – stopping “Russian aggression,” establishing “safe zones” in Syria, and fawning over noble “allies” like Saudi Arabia and Turkey – while growing legions of Americans have begun to see through these transparent fictions. Though the candidacies of Donald Trump and Bernie Sanders have many flaws, there is still something encouraging about Americans listening to some of straight talk from both Trump and Sanders – and to watch the flailing reactions of their establishment rivals. While it’s true Trump has made comments that are offensive and stupid, he also has dished out some truths that the GOP establishment simply won’t abide, such as noting President George W. Bush’s failure to protect the country from the 9/11 attacks and Bush’s deceptive case for invading Iraq. Trump’s rivals were flummoxed by his audacity, sputtering about his apostasy, but rank-and-file Republicans were up to handling the truth. Trump violated another Republican taboo when he advocated that the U.S. government take an evenhanded position on the Israeli-Palestinian conflict and even told pro-Israeli donors that they could not buy his support with donations. By contrast, other Republicans, such as Sen. Marco Rubio, were groveling for the handouts and advocating a U.S. foreign policy that could have been written by Israeli Prime Minister Benjamin Netanyahu. Trump’s Israel heresy brought the Republican foreign-policy elite, the likes of William Kristol and other neoconservatives, to full battle stations. Kristol’s fellow co-founder of the neocon Project for the New American Century, Robert Kagan, was so apoplectic over Trump’s progress toward the GOP nomination that he announced that he would vote for Democrat Hillary Clinton. Clinton, however, has had her own struggles toward the nomination. Though her imposing war chest and machine-driven sense of inevitability scared off several potential big-name rivals, she has had her hands full with Sen. Bernie Sanders, a 74-year-old “democratic socialist” from Vermont. Sanders pulled off a stunning upset on Tuesday by narrowly winning Michigan. While Sanders has largely finessed foreign policy issues – beyond noting that he opposed the Iraq War and Clinton voted for it – Sanders apparently found a winning issue in Michigan when he emphasized his rejection of trade deals while Clinton has mostly supported them. The same issue has worked well for Trump as he lambastes U.S. establishment leaders for negotiating bad deals. What is notable about the “free trade” issue is that it has long been a consensus position of both the Republican and Democratic establishments. For years, anyone who questioned these deals was mocked as a know-nothing or a protectionist. All the smart money was on “free trade,” a signature issue of both the Bushes and the Clintons, praised by editorialists from The Wall Street Journal through The New York Times. The fact that “free trade” – over the past two decades – has become a major factor in hollowing out of the middle class, especially across the industrial heartland of Middle America, was of little concern to the financial and other elites concentrated on the coasts. At election time, those “loser” Americans could be kept in line with appeals to social issues and patriotism, even as many faced borderline poverty, growing heroin addiction rates and shorter life spans. 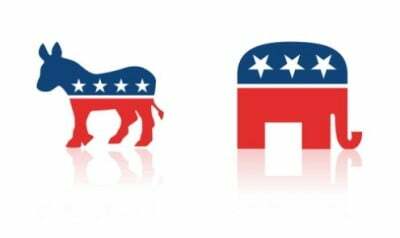 Despite that suffering, the twin Republican/Democratic establishments romped merrily along. The GOP elite called for evermore tax cuts to benefit the rich; demanded “reform” of Social Security and Medicare, meaning reductions in benefits; and proposed more military spending on more interventions overseas. The Democrats were only slightly less unrealistic, negotiating a new trade deal with Asia and seeking a new Cold War with Russia. Early in Campaign 2016, the expectations were that Republican voters would again get behind an establishment candidate like former Florida Jeb Bush or Wisconsin Gov. Scott Walker, while the Democrats would get in line behind Hillary Clinton’s coronation march. TV pundits declared that there was no way that Donald Trump could win the GOP race, that his high early poll numbers would fade like a summer romance. Bernie Sanders was laughed at as a fringe “issue” candidate. But then something unexpected happened. On the Republican side, blue-collar whites finally recognized how the GOP establishment had played them for suckers; they weren’t going to take it anymore. On the Democratic side, young voters, in particular, recognized how they had been dealt an extremely bad hand, stuck with massive student debt and unappealing job prospects. The two corrupt establishments were staggered. Yet, whether the populist anti-establishment insurrections can continue moving forward remains in doubt. On the Democratic side, Clinton’s candidacy appears to have been saved because African-American voters know her better than Sanders and associate her with President Barack Obama. They’ve given her key support, especially in Southern states, but the Michigan result suggests that Clinton may have to delay her long-expected “pivot to the center” a bit longer. On the Republican side, Trump’s brash style has driven many establishment favorites out of the race and has put Rubio on the ropes. If Rubio is knocked out – and if Ohio Gov. John Kasich remains an also-ran – then the establishment’s only alternative would be Texas Sen. Ted Cruz, a thoroughly disliked figure in the U.S. Senate. It’s become increasingly plausible that Trump could win the Republican nomination. What a Trump victory would mean for the Republican Party is hard to assess. Is it even possible for the GOP establishment with its laissez-faire orthodoxy of tax cuts for the rich and trickle-down economics for everyone else to reconcile with Trump’s populist agenda of protecting Social Security and demanding revamped trade deals to restore American manufacturing? Further, what would the neocons do? They now control the Republican Party’s foreign policy apparatus, which is tied to unconditional support for Israel and interventionism against Israel’s perceived enemies, from Syria’s Bashar al-Assad, to Iran, to Vladimir Putin’s Russia. Would they join Kagan in backing Hillary Clinton and trusting that she would be a reliable vessel for neocon desires? And, if Clinton prevails against Sanders and does become the neocon “vessel,” where might the growing ranks of Democratic and Independent non-interventionists go? Will some side with Trump despite his ugly remarks about Mexicans and Muslims? Or will they reject both major parties, either voting for a third party or staying home? Whatever happens, Official Washington’s twin corrupt establishments have been dealt an unexpected and potentially lasting punch.